TALLAHASSEE, Fla.(WTXL) — When severe weather took aim at North Florida and South Georgia on Sunday residents knew they were in a fight for their lives. "We were just in the house, just, like, praying, and trying to stay down and stay from the windows and stuff like that," said resident Sherrard Kelley. Some of the strongest winds hit the Baum Community. Homes were destroyed, debris was everywhere and residents were uncertain of what will happen next. Sherrad Kelly was one of the residents whose house was damaged by the twister, but some of his neighbors fared even worse. 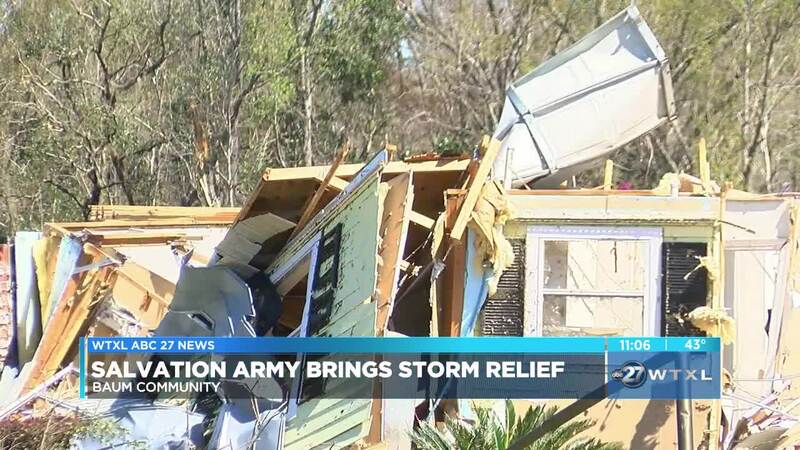 With the Tornado gone and the damage done, residents were in need of help and luckily help was on the way in the form of the Salvation Army. "They came to bring us some food and water, and they've actually been looking out for us," said resident Janika Brooks. The Salvation Army of Tallahassee brought food, water, and even spiritual counseling. Residents are thankful the organization was so quick to respond. "I appreciate the Salvation Army, cause you just don't know. It's hard, until you go through it," said Brooks. The organization will be at the Baum Community providing food until the Leon County Sheriff's Office tells them there is no longer a need.